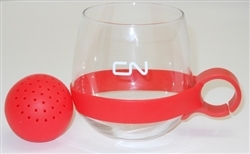 Glass Tea Mug with silicone tea ball diffuser. 16.75 oz/495 ml with printed CN logo. Gift box.